BYU basketball has had a lot of ups and downs in the last decade and has produced a ton of talent. Unfortunately, despite Dave Rose’s success BYU still suffers from a dearth of alumni making waves in the NBA. The good news is that there are still several recent graduates (probably more than you’d expect) who are playing extremely well overseas. Case-in-point: Charles Abouo–perhaps BYU’s last great defender–has bounced around various countries in the last few years trying to making a living playing ball. He isn’t currently playing in one of the top foreign leagues, but that isn’t stopping him from tearing it up in Qatar. He is ranked in the league’s top 10 in four different statistical categories, including 1st in steals and 2nd in points. Meanwhile, Haws, Broadus, Carlino, Davies, and Tavernari are all averaging double digit points for their respective teams and “The Jimmer” has finally returned to form in the D-League, where he is averaging 23 points per game and shooting 46% from behind the arc. Below are the playing statistics for each of the active players (2015-16 season). BYU currently has nine alumni playing basketball professionally and there is at least one active professional basketball player from every BYU class since 2009. There has been at least one player go pro from every class in the Dave Rose era with 19 total players since 2005. Tyler Haws (Class of 2015, @tyhaws3) is playing his first season in Europe, with Rio Natura Monbus in Spain. They are 5-6, tied for sixth in the 18 team Liga ACB. Through eleven games Ty is averaging 10.1 points, 1.5 rebounds, 0.4 assists, and 0.7 steals in 20.6 minutes per game. Matt Carlino (Class of 2014) is in his first season in Europe, playing for France’s Boulazac Basket Dordogne in the ProB League. In eight games he is averaging 12.5 points, 3.5 rebounds, 2.8 assists, and 1.3 steals in 27.8 minutes per game (Euroleague profile). Brandon Davies (Class of 2012) had a two-year stint in the NBA and is now in his first season for Openjobmetis Varese in Italy (Lega Basket Serie A). His team is currently 4-8 and Davies is averaging 11.9 points, 5.3 rebounds, 1.6 assists, 1.2 steals and 0.7 blocks in 26.2 minutes per game. Agustin Ambrosino (Class of 2013) plays for Alianza Viedma in Argentina (TNA). In 16 games he is averaging 6.3 points, 3.9 rebounds, and 0.7 steals in 22.0 minutes per game (Latinleague Profile). Charles Abouo (Class of 2012, @CharlesAbouo1) has bounced around a bit since 2012, but currently starts for Al Khor in Qatar (Qatar-D1). Through eight contests (4-4) he is averaging 27.1 points, 11.4 rebounds, 4.6 assists, and 4.4 steals in 40.8 minutes per game. He is currently dominating the league, ranking 2nd in the league in scoring (behind one of his own teammates), 7th in rebounds, 8th in assists, and 1st in steals (Basket Profile). 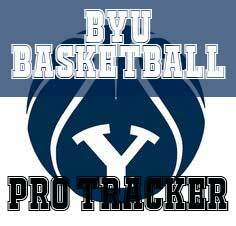 Jonathan Tavernari (Class of 2010, @For3JT) has been playing professionally overseas since graduating from BYU in 2010. He spent time playing in Brazil but is currently playing for BCC Corvengenze Agropoli in Italy (Serie A2). He is averaging 11.8 points, 4.2 rebounds, and 1.3 assists in 31.1 minutes through 13 games (Euroleague Profile). Lee Cummard (Class of 2009) has been playing in Europe since graduating from BYU and is currently in his third season with Belgium’s Aalstar. As a starter he is averaging 6.9 points, 5.0 rebounds, and 1.7 assists for 5h3 6-4 Aalstar team (Euroleague Profile). Rashaun Broadus (Class of 2007, @RashaunBroadus) has been a Euroleague journeyman since entering the league in 2009. He has played in the US, Ukraine, Lithuania, and for his current team, MKS Dabrowa Gornicza in Poland. Through 12 games this season he is averaging 14.9 points, 3.9 rebounds, 3.9 assists, and 0.8 steals in 33.3 minutes per game (Euroleague profile). Tip: If you are checking Euroleague or Latinleague statistics for a BYU alumni, go to their Euroleague profiles (listed above). In most cases it will tell you that you need to login (subscribe) to see their statistics, however, there is a free work-around. Click on the link to their team page and from there select the statistics tab. You should be able to see current statistics on that page. For more detailed game-by-game synopsis you can visit Jay Yoemans blog, JMoneySports.